How can electronic communication impact the right to a fair trial? How can witnesses be protected from intimidation? How can jurors be prevented from compromising their independence? The proliferation of electronic communication and electronic devices throughout modern society presents new challenges to the judicial system in protecting the right to a fair trial. Electronic communication, including texts, emails, blogs, social network posts, and other information accessed through the Internet, provides opportunities to expose confidential witnesses or informants, intimidate witnesses and victims from testifying, and bias jurors. Electronic devices can be used to record an image of a witness, identify that witness and expose him or her on the Internet, or communicate with a juror in an attempt to influence the outcome of a case. Jurors may also compromise their own independence by using electronic devices to access or share information about trial proceedings before the case is resolved. Court practices to protect the right to a fair trial have not kept pace with rapidly evolving electronic communication and devices, and traditional approaches to identify and protect against witness intimidation and to preserve juror impartiality are likely insufficient in the face of their near universal use, which facilitates access to information about nearly anything and anyone. On behalf of the National Institute of Justice, the Priority Criminal Justice Needs Initiative convened a panel, including judges, lawyers, educators, and other experts, to identify ways that electronic communication can impact the right to a fair trial and to recommend strategies to protect witnesses from intimidation and jurors from compromising their independence. The panel proceedings and recommendations are presented in this report. Legislation may help mitigate some of the problems introduced by electronic communication, but judges need discretion in their own courtrooms. Judges and attorneys need flexibility in engaging with jurors, who are used to communicating electronically throughout the day but must be limited during trial proceedings. However, jury sequestration to minimize or eliminate misconduct with electronic communication is considered to be generally impractical and counterproductive. Continuing education is also needed for the judiciary and court practitioners on evolving modes of electronic communication. Undertake fundamental research on how the exploding volume of electronic data could affect the protection of rights. Develop methods to better assess the effect on the judicial process of jurors' "outside research" during trials. Identify approaches both to limit juror use of mobile devices to do "outside research" during trials and to educate jurors on this issue. Develop methods to monitor juror and defendant social media activity, given concerns about the use of social media to influence judicial processes. The research reported here was conducted by the Justice Policy Program within RAND Justice, Infrastructure, and Environment. 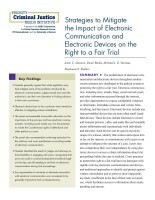 Dawson, Justin C., Duren Banks, Michael J. D. Vermeer, and Shoshana R. Shelton, Strategies to Mitigate the Impact of Electronic Communication and Electronic Devices on the Right to a Fair Trial. Santa Monica, CA: RAND Corporation, 2018. https://www.rand.org/pubs/research_reports/RR2155.html.